form a descending major scale a tritone away, in the key of Gb. In the Muzoracle, ascent and descent represent two very different flows of process. The ascending flow involves processes we intentionally initiate, or try to; the descending flow involves processes initiated outside of us, or within us unconsciously. Ascent is the upward flow of will; descent is the downward flow of Nature, of what comes down around us and through us. It’s not difficult to find examples of ascending and descending flows within ourselves. I wish to make breakfast, and conscientiously set about doing so: ascent. While doing so, last night’s dream keeps running through my mind unbidden: descent. Focusing my attention, I carefully flip the eggs at just the right moment: ascent. Meanwhile my legs support my shifting weight and keep me balanced: descent. The phone rings: descent. I choose to answer it: ascent. In a descending process, I am part of the flow; in an ascending process, I make the flow. Ascent is purposeful; descent is grace. Ascending processes from one perspective are often are descending processes from another, and vice versa. I intend to make breakfast: why? Because I’m hungry. Do I intend to be hungry? No, but my body is insisting. At whose bidding does my body insist? We see that ultimately we are in a descending flow: ultimately we serve; we are of and for Nature. From nature’s flow, though – for all things come to us through it – desires arise that move against or in spite of this downward pull, and we are called to act: to wish, to intend. Descent is realized through ascent; ascent arises from descent in turn. The scalepoints in the Muzoracle are associated with either ascent or descent. 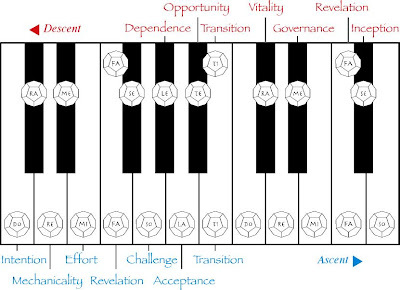 If a casting is ascending – if the black Musician’s Die is pointing upward – do, re, mi, fa, so, la, and ti (the diatonic scalepoints) are traveling upward, too. The other scalepoints, the chromatic ones – se, me, ra, te, and le – are traveling downward, against that upward flow. If a casting is descending – if the black Musician’s Die is pointing downward – things work in reverse: the diatonic scalepoints, like the Musician’s Die, travel downward, and the chromatic scalepoints travel upward against them. 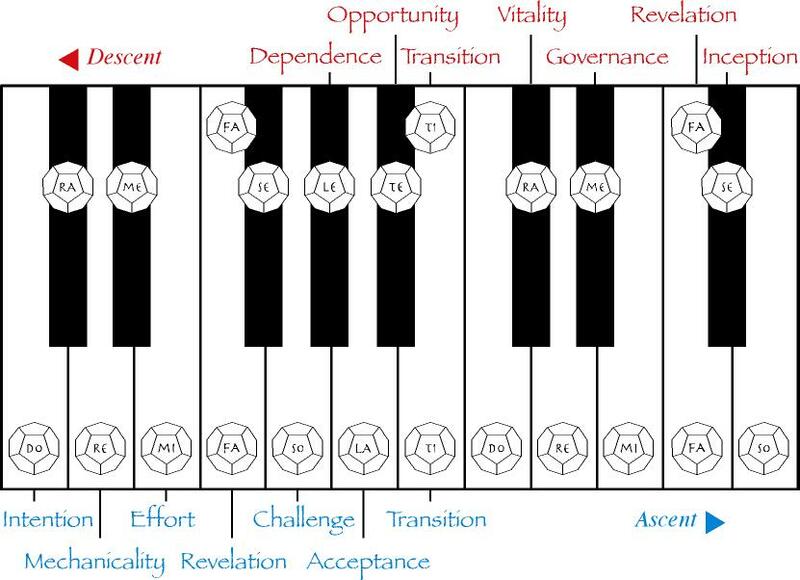 In the ascending casting pictured above, the diatonic scalepoints speak, of course, of the ascending process. It’s important to remember, though, that the descending points speak of the descending process, even though the casting as a whole is an ascending one. The querent in this case was a young woman asking about a future career as a singer. She started by rolling an Ab pointing straight up, indicating that the perspective of the casting was to be that of an ascending scale. Understood: she wants to sing, and this casting is going to look at what she wants, what she intends. Right out of the gate, though, she rolls a descending point: le, the point of Dependence. Now, in an ascending casting, le is the bottom point in a descending scale: it's like the weight at the end of a pendulum, pulling things down. Even though the whole of this casting – according to the Musician’s Die – is about the mountain she’s trying to climb, she’s confronted immediately with something that’s pulling downward from below and draining her energy. So… what is this drain? She draws a card and places it below le: a Major Seventh of Percussion, Lack in the Realm of the Physical. Gee whiz, I think. Could it be that this gal can’t carry a tune? I ask her about the nature of this lack that drains. It’s not so much a voice problem, she says. It’s a more of a vitality thing: she likes to think about singing, but actually approaching it wipes her out, like she’s trying to “run underwater”. 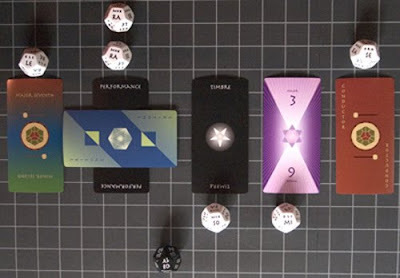 Interestingly enough, the next die she rolls is ra: the point of Vitality, and another descending point. Now, the point of Vitality is about energy sources and driving forces: of what here is it speaking? The source of the downward pull that’s draining her? Or an energy source she might draw on in her quest? The card she draws: Performance, which is crossed eventually by the Tritone of Strings. A paradigm shift in emotion crossed with the act of performing: a deep change in attitude, perhaps, a new emotional posture. Has she taken such a posture that’s spinning her down the tubes? Conversely, can she imagine such a posture that could take her where she wants to go? As the rest of the casting plays out, the second position remains key: a fundamental shift in attitude is available. Position 3 and 4 are both ascending points. The Broad Challenge at hand – so – is Timbre: inhabiting her destiny, filling her shoes. The Effort Required – mi – regards “Ease in the Realm of Spirit,” the Major Third of Voices: all of her efforts need to cleanly serve that which feeds her soul. The last position contains another descending point: se, the point of Inception. Underneath it she drew the Conductor of Percussion: Leadership in the Realm of the Physical. I asked her about this. It seems she’s thinking of starting her own band – as an instrumentalist. Perhaps the seeds for such a venture have already germinated.